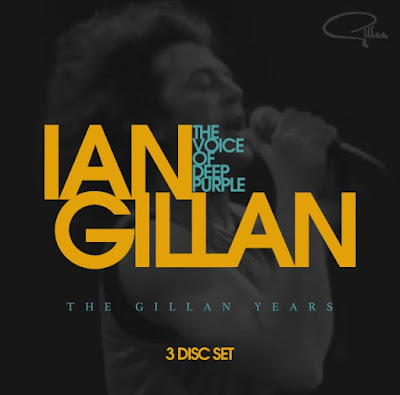 A new 3CD box set highlighting the solo works of Deep Purple frontman Ian Gillan has been announced. Due November 17, “The Voice Of Deep Purple: The Gillan Years” delivers three of the singer’s projects – 1977’s “Scarabus”, 1988’s “Accidentally On Purpose” and 1990’s “Naked Thunder” – alongside five bonus tracks: "Smoke On The Water", "Black Night" and "Restless" from Gillan; "Child In Time" and "Woman From Tokyo" from Ian Gillan Band, plus an interview with the rocker in Tokyo during the Gillan Japanese tour. “Scarabus” was the third and final studio album by the Ian Gillan Band. Gillan was co-billed on “Accidentally On Purpose” with Deep Purple bandmate and bassist Roger Glover. The rocker issued “Naked Thunder” soon after his exit from Deep Purple in 1989 (he returned in 1992). Produced by Bob Ezrin, Deep Purple will issue a limited gold edition of the project on November 3. The 2CD digipack release will deliver the original album alongside a previously unreleased 80-minute live show from Hellfest 2017, the biggest metal festival in France. In addition, Deep Purple will release the 97-minute documentary, “From Here to inFinite”, on Blu-ray; it presents, for the first time, the development of the album and a behind-the-scenes look at the inner workings of the band. "The Voice Of Deep Purple: The Gillan Years"